From Leo Reinisch (1878) “Der Irob-Saho in Abessinien”. In Sitzungsberichte der phil.-hist. Classe der kaiserlichen Akademie der Wissenschaften, 90: 121-133. For the complete text see here. 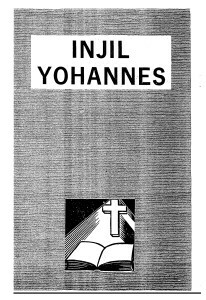 The translation in Saho-Irob of the chapter 11 of the Gospel of John (“The Resurrection of Lazarus”) was made by Abba Tesfay Maryam, an Irob priest from Alitena. But it should be noticed that in his previous article “Das Saho-Volk” (1877), he says that the translator is called Abatye Gere-Maryam. The text includes a German translation and a fidel transliteration of the latin Saho version. In the original article there are also some grammatical notes on the text. Reinisch in his Wörterbuch der Saho-Sprache includes several other translations of verses of the Bible, from the books of Genesis (ch. 1, 27, 37, 39, 40, 41, 42, 43, 44, 45, 46, 47, 48, 50), Ruth (ch. 1), Matthew (ch. 5, 10, 16, 26, 27), Mark (ch. 1, 5, 8, 14. 15) and, as in this article, John 11. 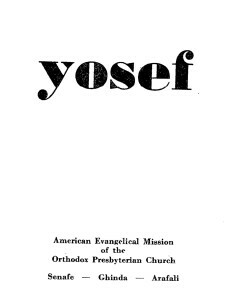 – Yosef (The story of Joseph). See below. – The Young Children’s Catechism. See below. – Who is God? See below. and some other materials like Saho Primer (Book one and Book two – The booklets are available here and here), grammatical notes, etc. The main Saho translators were Mohammed Ali (from Faqhat Xarak – Minifire) and Ibrahim Ismail ‘Americano’ (from Gacaso – Minifire). The list shown above is taken from Clarence W. Duff (1977) God’s Higher Ways. The birth of a Church. Nutley, NY: Presbyterian and Reformed Publishing Co. The book contains many references to the evangelistic work among the Saho in the second half of the XIX century. For a short biography of Francis E. Mahaffy written by Moreno Vergari (from Siegbert Uhlig (ed.) Encyclopaedia Aethiopica, Vol, 3, Harrasowitz Verlag, Wiesbaden 2007, p. 645) see here. Mahaffy used a personal system of transcription for the Saho. Here below there is a table that compares his system with the official Saho orthographies of Eritrea (Latin) and Ethiopia (Fidel) and IPA, for the letters that are different from the ones used in Eritrea. 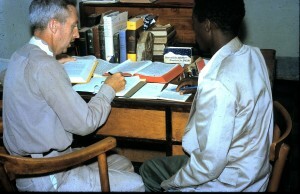 The translation of John was published in 1964 by Word Home Bible League. 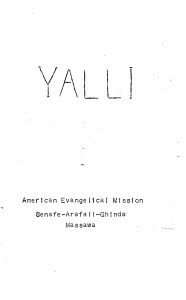 7,000 copies were printed by Park Press (South Holland, IL – USA) and sent to Francis Mahaffy, American Evangelical Mission, Senafe (Eritrea). This booklet is the translation in Saho of the story of Joseph, (the son of Jacob and grandson of Abraham) taken form the book of Genesis (chapter 37, 39-50). This booklet speaks about the unicity of God. The booklet lists 54 questions and answers about the basic elements of the Christian faith. 12 short audio Bible stories, evangelistic messages (total length: 42:01). 11 files with all the text of the book of Ruth of the Old Testament, with introductions and overview of the book (total length: 33:18). 7 files with all the text of the three letters of John of the New Testament (total length 29:37). 6 files with all the text of the first six chapters of the Gospel of Luke of the New Testament (total length 55:14). 4 files with all the text of the chapters 7-10 of the Gospel of Luke of the New Testament (total length 44:00). 13 short audio Bible stories, evangelistic messages (total length: 48:23). The film of the story of Jesus based on the Gospel of Luke. Click here to watch and download. Published in Incontri linguistici, 37 (2014): 133-44. A pre-publication version can be downloaded here.